Often forgotten, the charitable wine-auction of the Hospices de Nuits is a compact and bijou version of the magnificent sale that takes place each year on the third Sunday of November in Beaune. Taking place on the last Sunday before Easter, and heralded by the Nuits St.Gearges half-marathon, rarely are there television cameras or famous (in France) actors in attendance, and neither do Christies beam and syndicate the auction bids around the globe, but here is a charity no less noble and no less worthy of your support: the Hospices de Nuits still cares for the sick and elderly of the town and help provide guide-dogs for the blind – their recent wines have been excellent too! The date of first recorded hospital in Nuits was about 1270 but there is little recorded (and preserved!) history so we must fast-forward to 1692 when the Sun-King himself, Louis Quatorze, agreed to consolidate the numerous small ‘maladières’ of Nuits into one larger hospital – a part of those consolidated buildings was already constructed as early as 1633. Despite their venerable age, the buildings of today’s Hospice lack the architectural impact of their cousin in Beaune, they also lack the luxury of a meaningful archive; so despite a long history of land and vineyards being donated in exactly the same fashion as the l’Hopital de Beaune, the ‘Domaine Viticole’ has no record of who those benefactors were. Just like the rest of the Côte d’Or, the concentration on vines to the exclusion of all-else is a modern phenomena; for hundreds of years the charity of the Hospices was responsible for a mixed economy of animal, agricultural and viticultural work. Much of this was abandoned in the immediate aftermath of the Second World War; a new generation only began to renew the concept of the Charity in the 1960s. 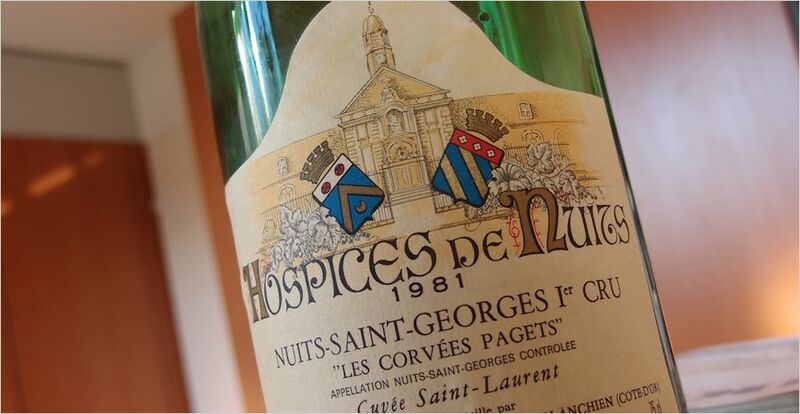 Traditionally the Hospices de Nuits had sold their wine in bulk to the négoce, but starting in 1961 they chose to follow the lead of the Hospices de Beaune and began their own auction. For a charity like the Hospices de Nuits this remains the ideal approach; a useful price-premium versus selling direct to the négoce (it’s a charity after-all), no commercial department is required, no importers to deal with, very few visitors, and all the paraphernalia associated with bottling is someone-else’s responsibility. The Hospices de Nuits clearly has a lower profile – and much lower (cash) turnover – with aturnover of about half a million euros at the auction they are about one-tenth the the size of the Hospices de Beaune jamboree. But they stop at nothing to increase the momentum of their sale, packaging the Nuits Half-Marathon (and 10km for wimps! ), Les Nuits au Grand Jour tastings, Cabarets, Chocolate fairs, Vintage car rallys, etcetera, into the same weekend. That said, Jean-Marc emphasisies that this is no excuse for high yields, the doamine typically yielding thirty to thirty-five hectolitres per hectare from their efforts. There is a single application of herbicide out of the growing season and then the dead material is ploughed into the soil, pheromones (‘confusion sexuelle’) are used throughout the growing season. Grapes are harvested manually then triaged back at the cuverie (which was new for the 2002 harvest). Grapes are destemmed before fermenting in stainless-steel tanks; the tanks may be cooled to 14°C if the temperature is higher, after which, fermentations are allowed to take their normal course. Cooling of the tanks is possible and a system of automatic punching-down (pigeage) is in-place. The wine is then fed by gravity into one-hundred percent new oak from a mix of three barrel-makers; Damy, Berthomieux and Sirugue – all barrels have the equivalent toasting of ‘moyen-fort’ or medium-strong. The barrels lie in a fine underground cellar under the cuverie. Just like the Hospices to Beaune, what ends up in the bottle is largely in the hands of the particular négoce that buy the wines – appraisal of young wine is never easy, but at least in the case of the Hospices de Nuits, the négoce have a better feel for the quality because they are auctioned in the March, rather than November. This also brings the work of the domaine is starker focus. The wines of the 1980s and 1990s had an ‘average’ reputation; good in good vintage, less-good in a less-good vintage. Certainly since the new cuverie was established in 2002 the wines’ reputations have improved. Perhaps it is the inherent muscle of Nuits St.Georges that makes the difference, but despite a relatively strong barrel-toasting, I don’t find the oak as intrusive on young wines as I often do cuvées of the Hospices de Beaune. About 8.8 hectares of the domaine’s vines lie within the communes of Nuits-Premeaux and include nine Premier Crus, and that rare thing; a Premier Cru white from Nuits that is made from Chardonnay rather than ‘Pinot Gouges’ – it’s definitely worth a test! I will single out two reds. Despite the significant presence of the Nuits ‘grand cru’ of Les St.Georges I will suggest the Premier Crus of ‘Les Porrets’ and ‘Les Didiers’. Les Porrets has a certain plushness in its youth that makes a great foil for the energy that the wine delivers – it is great fun. Les Didiers, since the 1920s, is a monopoly of the domaine – one of many monopolies in the area of Premeaux – it’s also a wine that’s hard to generalise about as they vineyard is large enough that three separate cuvées are bottled. Don’t do it just for charity, you can also do it for your taste-buds!